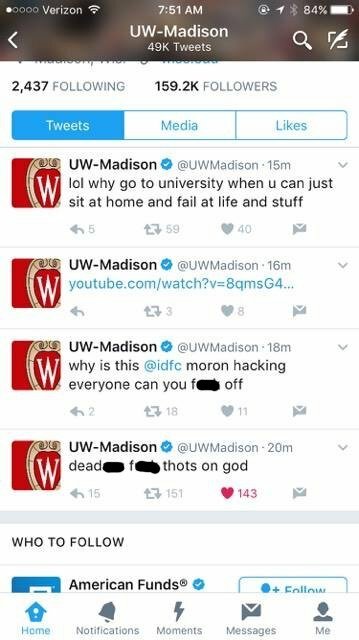 Well, it looks like the University of Wisconsin will be changing its Twitter password sometime soon. On Wednesday morning, the school's official account started tweeting everything from profanities to a rap music video to a question about the point of going to college in the first place. As of 9:30 a.m., the tweets were still there. 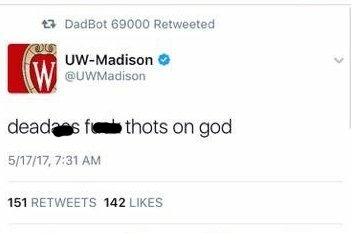 Again, you can almost guarantee it's a hack, but what if the school's social media editor is having some sort of existential crisis? Why go to university when you can just fail at life? I don't know, man. I just don't know.